In the early ’90’s, Cuban rafters began to cast off in alarming numbers. On July 13, 1994, Cuban government boats sank a commandeered tugboat that left at least 39 people dead. The next month, outraged Cuban citizens watched the government retake a hijacked ferry in Havana Bay to thwart another escape attempt. Rioting erupted. People chanted anti-government slogans, carried signs that said “Assassin” and “Down With Fidel” and threw stones at police. Castro blamed the U.S. for encouraging hijackings. He unleashed a mass exodus, inviting 30,000 Cubans to leave by launching a junkyard armada. The U.S. Coast Guard set a new record on Aug. 19 with 745 Cubans rescued at sea. President Bill Clinton announced that intercepted rafters would be sent to the Guantanamo naval base, detained indefinitely or sent home. By fall of 1994, refugee camps at Guantanamo naval base swelled. The 30,000 detainees were impatient with life in the dusty tent cities, and concerned that they wouldn’t be allowed to apply for admission to the U.S. Not until May 2, 1995, would Clinton allow most of the detainees into the country. 6/8/1993: Hector Gabino/El Nuevo Herald Staff -- Juan Carlos Perez Corredosa (white shirt) hugs friend David Ruly Rodriguez moments after being taken by Coast Guard helicopter to Key West. The two men, along with Pedro Caraballo who looks on and four other friends, left Cuba on a homemade inner tube raft May 28. After six days at sea, the group was spotted June 3 by a Brothers to the Rescue plane and rescued by the Coast Guard. 3/23/1994, Candance Barbot/Miami Herald Staff: Dateline Key West -- They made it. Carlos Manuel Ruiz, 27, and Mercedes Figueroa, 34, wait at Key West Transit Center on Stock Island after being rescued at sea Monday. 10/16/1994, David Lawrence Jr./Miami Herald Staff: Seeking a better life: for all the good U.S. intentions and resources, life in the camps is a long way from normalcy and comfort. 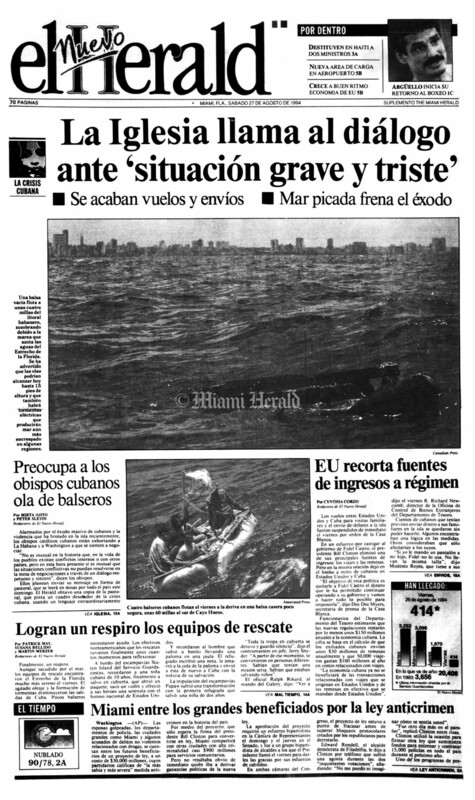 1/1/1994, Miami Herald Staff: Cuban rafters on the way through Cojimar to launch their rafts towards the U.S.
8/24/1994: Charles Trainor Jr./Miami Herald Staff -- Desperation at sea: A woman and her child plead for help Wednesday as they and other rafters drift 45 miles off the coast of Cuba. Published on 1A of The Miami Herald Thursday, August 25, 1994. 1/1/1994, Miami Herald Staff: Cuban rafters prepare to leave shore of Cojimar while others look-on. 1/1/1994, Miami Herald Staff: Victim of the sea. A Cuban policeman moves onlookers away from the body of rafter washed ashore in Cojimar. 8/20/1994, Miami Herald Staff: Cubans leave shore of Cojimar in Cuba. 1/1/1994, Miami Herald Staff: A group of Cuban rafters prepare to leave Cojimar, as others look-on. 1/1/1994, Miami herald Staff: Cuban rafters. 1/1/1994, Charlie Trainor/Miami Herald Staff: Cuban rafters. 1/1/1994, Angel E. Valentin/Miami Herald Staff: A group of rafts full of Cubans afloat in the Florida straits. 1/1/1994, Chuck Fadely/Miami Herald Staff: Cuban rafters. 1/1/1994, Chuck Fadely/Miami Herald Staff: Rafters in the Florida straits about 40 miles north of Havana. 1/1/1994, C. M. Guerrero/Miami Herald Staff: Cuban refugees rescued at sea. 1/1/1994, Jeffrey Salter/Miami Herald Staff: Cuban rafters who ended up on Cay Sal await a coast guard ship to be rescued. The cubans are walking to an airdrop of water from the "Brothers to the Rescue" who were droping supplies to stranded rafters in the islands of Elbow Cay, Anguilla Cay and Cay Sal. 1/1/1994, Chuck Fadely/Miami Herald Staff: Rafetrs in Florida straits 40 miles north of Havana picked up by Coast Guard cutter Gallation. 1/1/1994, Angel E. Valentin/Miami herald Staff: Cuban refugees. 1/1/1994, Marice Cohn Band/Miami Herald Staff: First Cuban refugees to arrive at Guantanamo. 1994, Jeffrey A. Salter/Miami Herald Staff: U.S. Rep. Ileana Ros-Lethinen at the Cuban refugee camp in Guantanamo tries to give them support. She also brought letters from relatives in Miami. 1994, Marice Cohn Band/Miami Herald Staff: Cuban refugees at Guantanamo naval base. 1994, Miami Herald Staff: Guantanamo refugee camp. 1994, Jeffrey A. Salter/Miami Herald Staff: Cuban rafters detained at Guantanamo. 1994, Marice Cohn Band/Miami Herald Staff: Robert San Portuando, 7, at Guantanamo Naval Base. 5/16/1993, Hector Gabino/Miami Herald Staff: Maria T. Santana is step-grandmother (his grandfather's wife) to Frank Santana. Taken at airport. 5/27/1993, C.M. Guerrero/Miami Herald Staff: Frank Miguel Gonzalez, 9, whose mother Raisa perished attempting to escape Cuba on a raft, patiently waits for his grandmother to arrive from Cuba for services for his mother. 5/22/1993, Miami Herald file photo: Raisa Teresa Santana, Cuban refugee who died at Jackson Memorial Hospital. She and her son Frank Miguel Gonzalez, 9, were picked up in the Florida Straits by a cruise ship. She was airlifted from the Bahamas to the hospital in a coma. She had drunk seawater, giving all that remained of the fresh water to her son. 5/29/1993, C. M. Guerrero/Miami Herald Staff: Hundreds of people participated in the funeral procession for Raisa Santana, the Cuban born rafter who died in the Florida Straits trying to reach Miami.